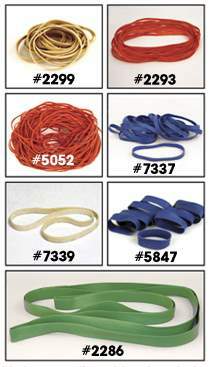 Quality rubber bands in various sizes and lengths for use in our toy gun, car and boat projects. Made in USA. #2299 Tan Rubber Band is 1/8" x 2-1/2". #2293 Red Rubber Band is 1/8" x 6". #5052 Red Rubber Band is 1/8" x 8-1/2". #7337 Blue Rubber Band is 1/4" x 4". #7339 Tan Motor Drive Band is 1/4" x 7". #5847 Blue Traction Rubber Band is 7/16" x 2". #2286 Green Rubber Catapult Band is 3/4" x 46".